February | 2015 | Sonic Smash-Music! The composer and producer of digital dance music known as David Smith has released his debut single, “Sensation.” The track represents Smith’s electronica masterpiece for the start of the 2015 year and showcases him as one of Europe’s most promising up-and-coming digital musicians by a long stretch. With an extremely strong repertoire available for listening at his official website and his debut single, “Sensation” available for purchase and download around the world, things are sure looking up for this surprise EDM genius from the Kingdom of Belgium. David Smith (who has an English name but natively speaks French) cites as main artistic influences many of heroes of the DJ subculture, including David Guetta, Calvin Harris, Avicii, and Martin Garrix. It was a humble beginning, but clearly the start of something more than a simple hobby. The music fan’s first listen of “Sensation” is not likely to be his last. In fact, the second and third listen are probably to follow immediately afterward. From here, curiosity leads the listener to Smith’s other tracks, of which there are already enough to fill an LP record. But the artist is taking it slow. This perfectionist’s attitude shines through in his debut single, “Sensation.” Its production is sparkling clean, its composition naturally consistent and with an upbeat, intuitive flow. Its hooks are unshakable and its four-and-a-half minutes go by in a flash. The ‘replay’ button beckons. Smith goes on to describe the emotional effects he crafts his music to inspire. His message to the world is simple. “Sensation” by David Smith is available online worldwide. Fans of EDM and electronica should definitely get in early. Very early. 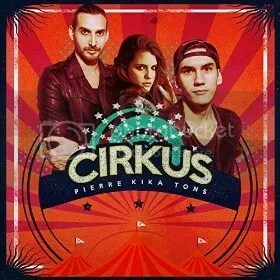 The trio of DJs from Venezuela known as Pierre, Kika and Tons have released their capital new single, “Cirkus.” The track has been proudly released on the Estereo Records independent music label. Vivacious, spirited, and exploding with life, “Cirkus” is one of the most striking digital dance singles to arrive from South America in years. Pierre, Kika and Tons are based in the Caribbean city of Caracas, each having his and her own solo career as a DJ and composer of digital music, respectively, though Pierre and Tons have a two-year history as collaborators. The trio celebrated their “Cirkus” single with an eponymous tour which has been highly publicized and received with great enthusiasm by fans in their home nation of Venezuela as well as by new fans in the United States. “Three talents represented by Blackpin Prods., CA they have different approaches in how to make good music, reflecting perfect harmony with ‘Cirkus’ to convey feelings and intense emotions with a theme focused on the electro progressive sound. This is possible thanks to the contributions and differentiators that characterize them. “Kika is a young leader of the electronic music scene within the women’s movement. She has been onstage with Jacob van Hage, Beyoncé, Dimitri Vegas & Like Mike, Wolfpack, Nicky Romero, and performed recently at Paradise 507’s Music Fest, Panama. Between them, Pierre, Kika and Tons have approximately 30,000 followers on their official Soundcloud pages, and very nearly the same amount on their official Facebook sites, as well. Collectively they have performed with such names as Nicky Romero, Borgore, Loco Dice, Marco Carola, Adrian Luz and Nadastrom, Steve Aoki, and Adrian Lux. “Cirkus” by Pierre, Kika and Tons is available online worldwide. 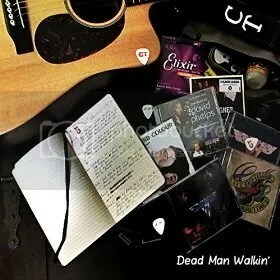 The singer and songwriter of rock music known as Chris Michael Taylor has released his capital new single track, “Dead Man Walkin’.” The track is the first official single to be debuted from his upcoming freshman LP album. Impeccably, sonorously sung and featuring evocative songwriting and razor-sharp guitar work, “Dead Man Walkin’” by Chris Michael Taylor is a return to everything that was good about rock music in the early ’80s that bears none of what was bad. Taylor’s upcoming album, the release date and title of which have yet to be announced, has been rumored to be a collection of rock songs largely written by Taylor and performed by him on acoustic guitar. This represents a rare style of rock music played acoustically which has characterized the artist’s sound since he appeared on the national radar in 2013. Chris Michael Taylor cites as main music influences Eddie Van Halen, Stevie Ray Vaughan, George Lynch (Dokken) and Jake E. Lee (Ozzy Osbourne). Of these, the first two share the most similarities with Taylor’s writing and singing styles, whereas his guitar chops are sharper and edgier in the tradition of guitarists with heavier styles such as Lynch’s and Lee’s. However, Taylor’s “Dead Man Walkin’” isn’t just a rock song. If it were, choosing a strictly acoustic sound for the track might seem dubious. Enough elements of pop shine through his rock overtones to carry the song above traditional rock music into a new realm of rock-based pop, though, and these pop attributes make Taylor’s singer-songwriter method work wonderfully. The pop fringe with which Taylor has gilt his latest single (and presumably his upcoming record) is informed by his penchant for musicians like Michael Jackson, Justin Timberlake and Bruno Mars. North Carolina’s Chris Michael Taylor developed an obsession with music at the age of five by discovering an album by Eddie Van Halen. Now seeing his solo career truly begin to boom at the start of 2015, Taylor is also the lead guitarist in the up-and-coming country/rock band Early Ray, lead guitarist with Vinnie and Carmine Appice in Drum Wars, and lead guitarist in the classic-rock tribute band, Sunset Strip. Taylor has performed live at venues across America and has shared the stage with such legends as Elliot Rubinson, Rudy Sarzo, Kip Winger, Michael Sweet and Tommy DeCarlo, among others. “Dead Man Walkin’” by Chris Michael Taylor is available online worldwide. Rock fans shouldn’t miss it. The singer and songwriter known around the world as Giano Veneziani has released his newest official single, “Esa Sensación que Nos Atrapa.” The acoustic version of this adult-contemporary pop song hit online shelves on the 16th of February, appropriately timed to appear in the wake of Valentine’s Day as a ballad about “That Feeling which Traps Us.” Exquisitely written, tastefully orchestrated and sung with the natural, heartfelt voice his fans have grown to love, “Esa Sensación que Nos Atrapa” by Giano Veneziani is easily one of the most beautiful songs to appear in 2015 so far. 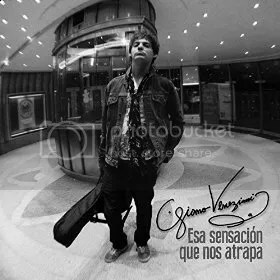 Argentina’s Giano Veneziani cites as main musical inspirations great music writers such as Astor Piazzolla, Charly Garcia, Fito Paez, and Mark Knopfler. His own sound, like virtually every piece of music written by these legendary scribes, is rooted in the art of crafting a song which reads as strikingly on the page as it sounds when filling the ear. Though “Esa Sensación que Nos Atrapa” glows with masterful instrumentation, it retains a classic minimalism which showcases its purity of form and leaves room for Veneziani’s raw, earnest vocals to be properly appreciated. Asked to describe the overall themes of his music, Veneziani comes right out and admits that this is, in fact, his artistic goal, just as one would expect. Giano Veneziani is a poet and songwriter born 6 October 1982 in Buenos Aires, Argentina. He began playing Spanish guitar at 17 and began composing music and lyrics. His music spans a range of genres, his vocals most often blending tones from both rock and soul music. To date he has performed in 67 cities in 40 of the United States. He is currently recording his debut EP in Florida. It is expected to drop worldwide in 2015. “Esa Sensación que Nos Atrapa” by Giano Veneziani is available online worldwide. The international music artist known as Zeynep Ozbilen has released her latest official record, “Zee.” The album has been proudly published as an independent title without ties to the corporate music industry of any part of the world. It comprises a collection of 12 tracks, many of which are original songs by Ozbilen herself but also featuring rearrangements of popular classics such as “Spinning Wheel” by Blood, Sweat and Tears. 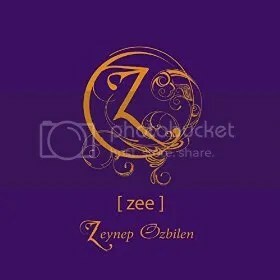 An indescribably multicultural record with moods, styles and textures from an array of various nations, “Zee” by Zeynep Ozbilen is one of the most colorful and intriguing musical experiences to reach music stores in some time. The Toronto-based Zeynep Ozbilen cites as main artistic influences Marc Anthony, Jennifer Lopez, Gloria Estefan, Celia Cruz, Buena Vista Social Club, Shakira, Tony Bennett, and Michael Buble. As might be intuited from this list, a large portion of her music stems from the Latin jazz movement, and it is largely this dose of ‘el ritmo Latino’ which makes her record so very danceable and infectious. It is not, however, a dominant musical component in “Zee” so much as it is a sonic partner with the album’s other key element: a strong foundation on Turkish music. In fact, it is this traditional Ottoman sound which first introduces the album once the listener hits ‘play.’ Ozbilen’s second track follows, beckoning, “Come to Istanbul.” When the third, much more Latin-based song begins, it dovetails with the previous Mediterranean style so elegantly that the listener feels transported. The songs on Ozbilen’s “Zee” have been turning heads all over the world, even previous to the record’s official release on February 20th. “Zee” by Zeynep Ozbilen is available online worldwide beginning 20 February 2015. Get in early. Very early. The rapper and producer of hip hop known as J-Merk has released his latest LP album, “Born Dead.” The full-length record has been proudly published on the Just-Us Music independent label without the involvement of the corporate music industry. It comprises approximately 40 minutes of heavy-hitting urban poetry and powerful back beats in 13 original tracks. 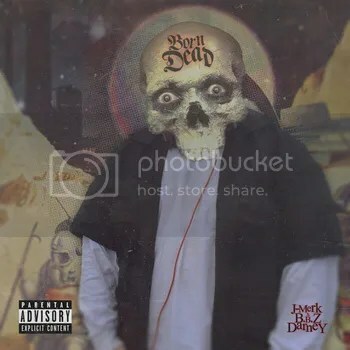 In addition to the rhymes of J-Merk, himself, “Born Dead” also features the talents of popular Swedish producer BBZ Darney. Neck-deep in groove, socially poignant and strikingly well-written, “Born Dead” by J-Merk is sure to be remembered as one of the most important indie rap releases of 2015. The remarkably immersive, extremely well-orchestrated music of “Born Dead” creates a kaleidoscopic backdrop against which J-Merk delivers his lines. This swirling blend of music and samples forms a large part of the undeniable draw of “Born Dead,” a record which comes out of the gate swinging and doesn’t let up. Still, it is the razor-sharp writing and seemingly perfect flow of J-Merk’s rap which truly steals the limelight. Like every other phrase painstakingly crafted to a ‘T’ on his new album, the title is also significant. While a great many hip-hop mixtapes are dropped to which a broad variety of people do not necessarily relate, “Born Dead” speaks a message fans of any genre can understand, a record in which anybody can find personal meaning. J-Merk is a 25-year-old rap artist born and raised in Chicago. He has been writing rap lyrics since the age of 12 and producing music in the studio since the age of 15. Since that time he has worked with multi-platinum and Grammy-nominated producers, as well as with many talented and established rap artists from all over the world. His debut EP appeared in 2012. “Born Dead” is only one of several official releases slated to drop from J-Merk in 2015. “Born Dead” by J-Merk and feat. BBZ Darney is available online worldwide. Get in early, rap fans. The “Born Dead” LP album is currently being offered at a special price from the artist’s official Bandcamp website (link provided below). The singer and songwriter of gospel music known as Clifton Poyotte has released his latest LP record album, “Blue Skies.” The LP is composed of 14 new tracks for an approximate total listening time of one full hour. It has been proudly published as an independent release entirely without the support of the corporate music power structure. Upbeat, powerful, and full of the might of the holy spirit, “Blue Skies” by Clifton Poyotte is the latest evidence that the lasting strength of contemporary Christian music is still rooted in the Biblical tradition, itself. Born and raised on the Caribbean island of St. Lucia, singer Clifton Poyotte cites as main artistic influences Donnie McClurkin, Alvin Slaughter, and Smokie Norful. While Poyotte has clearly been performing music for decades and has reached an expert level of skill, “Blue Skies” remains his most widely distributed official record to date and may be considered a debut LP on that score alone. 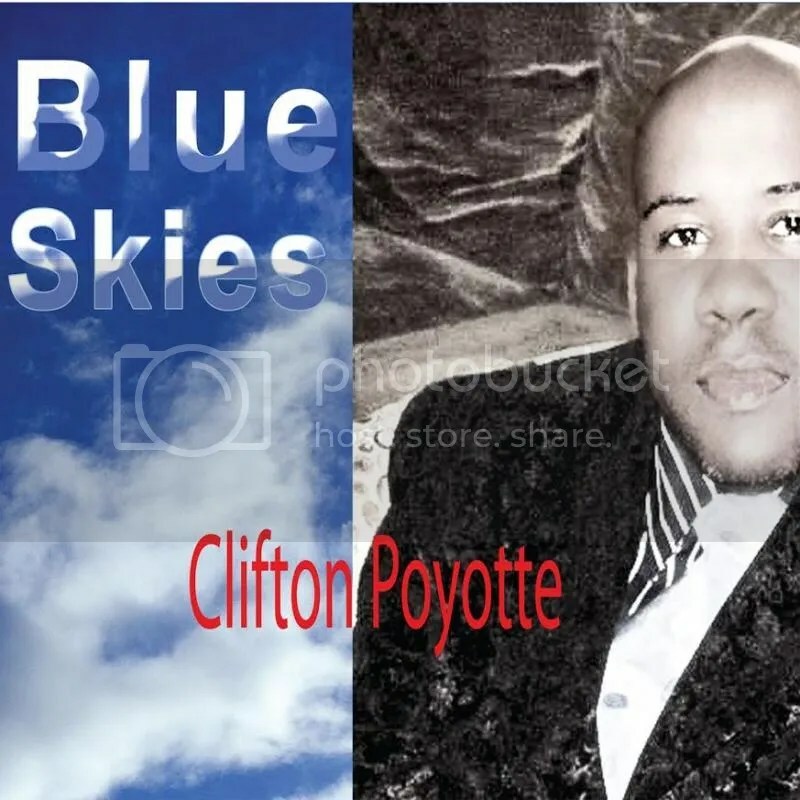 Clifton Poyotte’s “Blue Skies” album is a mix of songs from a wide variety of music styles, including (but not limited to) the adult contemporary, classic gospel, R ‘n’ B, pop, and even reggae genres, many of which are blended together on the LP for a new sound that is strictly Poyotte’s own. His natural singing voice is reminiscent of the best male gospel performers, a mix of raw, unadulterated talent and polished skill which has obviously taken shape over many performances. The sheer quality of the record, not to be overlooked, is neither to be considered the album’s chief charm nor its primary aim, however. While the music of “Blue Skies” is clearly majestic and moving, its lyrics point to more celestial sources for their inspiration and remind the listener time and again that the music is intended as much to please heavenly ears as it is to uplift and encourage the earthbound. A heartfelt work of worship, praise, and personal devotion, “Blue Skies” is an album music lovers of all faiths can understand and appreciate. “Blue Skies” by Clifton Poyotte is available online worldwide.